Watch Phil Ponce of WTTW’s Chicago Tonight interview Karen Kane about her book, Voices of Governance. 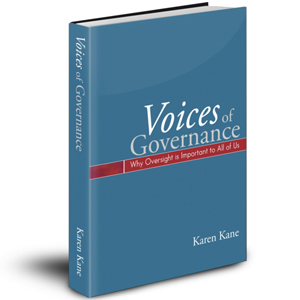 Listen to Broc Romanek of The Corporate Counsel interview Karen Kane about her book, Voices of Governance. Just published. Voices of Governance: Why Oversight Is Important to All of Us. Buy it now at Amazon or Barnes & Noble (for Nook). Or, download it now in PDF format by entering your email and contact information. What are Boards of Directors supposed to do? And what have they been doing? Central to the success of modern business practices and financial markets is the idea that corporate governance practices will define how an enterprise is directed and controlled, and make changes needed to ensure that the interests of shareholders are looked after in a responsible, professional, and transparent manner. Boards of directors are elected and charged with exercising prudent oversight stands at the center of the system. The board’s oversight of the enterprise is intended to instill confidence and serve as a check on management. Listen to the conversation as business leaders, governance experts and shareholders discuss what’s right with governance, and talk about the solutions being developed across today’s business, legal and political frontiers. The dialogue conveys the concerns and issues as well as well as answers that deliver the true transparency and oversight that protect shareholders. At the same time Voices describes an increasingly wide range of stakeholder and public policy interests in the operational and financial domains of corporations today.